Here’s a tip: if you’re leaving one of the most influential developers in the industry, it had better be to work on something as cool as Quantum Conundrum. In 2009, Portal creator Kim Swift left Valve to pursue a new IP with Airtight Games. We’re now happy to report her gamble has paid off - big time. Quantum Conundrum is a first-person puzzle-platformer made to stretch the cerebellum. Yes, the superficial similarities to the Portal games are here: a protagonist trapped in a whimsical yet deadly environment, an ambivalent narrator, and puzzles that would make your physics professor weep tears of frustration and joy. But thanks to QC’s amusing art style, and entirely original gameplay mechanics, we wouldn’t dare call it a Portal rehash. As the 12-year-old nephew of eccentric genius Dr. Fitz Quadwrangle (to whom you are something of a nuisance), your adventure begins in your uncle’s stately manor. The place is a pleasant mash-up of a Willy Wonka and Dexter’s Lab sensibility – big fluffy furniture, portraits of enigmatic relatives, and tubes piping bright yellow “science juice” every which way. A décor aesthetic we’ll call tasteful yet insane. What little sense of normality the scene achieves is soon dissolved by a mysterious explosion, followed by an eerie glow. Over a PA system, your uncle’s disembodied voice informs you that he’s trapped…somewhere, and you’ll have to use his latest invention, the Interdimensional Shift Device (IDS for short) to rescue him from limbo. The IDS has four reality altering powers – one to make things heavy, one to make things light, one to that inverts gravity, and one that slows down time. 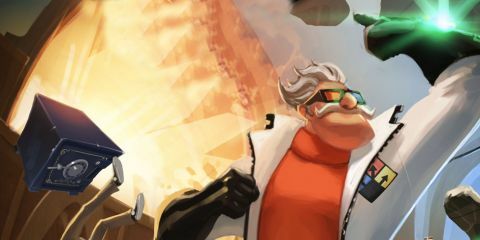 QC’s perfectly paced gameplay introduces these powers, and then lets you command them – all at a clip that rivals the learn-as-you-play methodology of the Portal games. The flawless rate at which the game amuses you with new concepts, ups the challenge, then moves on to something new, is its greatest asset among many notable ones. Activating a power (or shifting dimensions, as Uncle Quadwrangle would put it) has an all-encompassing effect on your environment. Making things light via the fluffy dimension gives everything around you the soft and white sheen of a new mattress. The heavy dimension gives the room an armored look, and whatever power you use also affects the various family portraits hung around the mansion. Slow down time and you’ll see cobwebs hanging off the figures they portray, or the bottoms of their feet suspended in the air, after shifting into the gravity-inverting dimension. It’s a unique visual gag that never gets old. Visually fresh as well as teasingly challenging, QC is a perfect blend of logistical problem solving and fast-paced platforming. The game’s every challenge has both a cerebral and a kinetic side: first you figure out what to do, then you have to execute correctly. Whether it’s jumping over laser beams or hopping from floating armchair to levitating safe, knowing what dimension to shift into and which conveyor belt to ride is only ever half the battle. Description Gameplay-wise, Quantum Conundrum is exemplary. Puzzles never feel cheap, and always rely on mechanics that were properly elaborated on, and finishing them consistently put a wry smile on our face, and a feeling of why didnt I think of that sooner in our minds. If you had even a passing enjoyment with the Portal games, or any of the recent influx of indie puzzle-platformers, we cant recommend Quantum Conundrum enough.